Why is it that such tasty ingredients as fruit, nuts, and spices can end up in such a vile product as the common fruitcake, that morsel which has become the brunt of many a cruel joke? We all know the cliche of the regifted fruit cake. I think it is because, as a rule, not many cooks care enough about what comes out of their oven to take the time to use wholesome ingredients. Why chop fruit and crack nuts when you can grab a tub of artificially colored fruit off the grocery store shelf? Because that tub of goo has all the flavor and appeal of a picked-green-ripen-in-the-truck-on-the-way-to-the-market tomato. Yesterday I did some research on such cakes and created my own version which is quite tasty, if I do say so myself. How many days must one labor in the kitchen to produce it? Relax – it was done in 3 hours and that included the long slow baking time. Fruit cakes keep for extended periods of time because the moisture content in them is very low – low enough usually to prohibit the growth of nasties which promote spoilage, thus the length of baking time is much greater than other cakes. Your batter should be stiffer than a regular cake batter, but yet easily stirable. If we examine the fruit which is one of the major ingredients in the cakes, we find that fruit in and of itself is usually sweet with a kiss of tartness to pique our tastebuds without the trace bitterness found in most commercial products, therefore, I used only top quality dried fruits and avoided the stuff in the tubs altogether. I used 1 lb. of dried fruit that was a combination of apples, apricots, golden raisins, and cherries. Other excellent choices would be currants, cranberries, blueberries, etc. I used pecan meal and sliced almonds for the nuts, and I do admit to being too lazy to pick out the nuts myself. Since I research, produce, and sell a line of period spice blends which date as far back as the 1300’s, I naturally used whole spices I ground myself so as to get the utmost in flavor from them. I used a combination of cinnamon, nutmeg, and mace, but cloves or allspice and ginger would be fine also. Combine all ingredients into a medium sized saucepan, bring to a boil, and simmer for 3 to 4 minutes. Turn off heat and allow this mixture to cool. (From here you can continue the next day if you wish) If you’re in a hurry, simply place the pan in the sink and run some cold water to come to about half way on the pan. The fruit, butter, and sugar mixture after it has been set aside to cool. zest from the orange (no white, zest only), 2 eggs, 2 cups self-rising flour (if the batter is too thin, add another 1/4 cup of flour – fruit varies in the amount of liquid it takes to reconstitute it), a half teaspoon of mixed spice, and 1 1/2 cups of nuts. Stir well together. 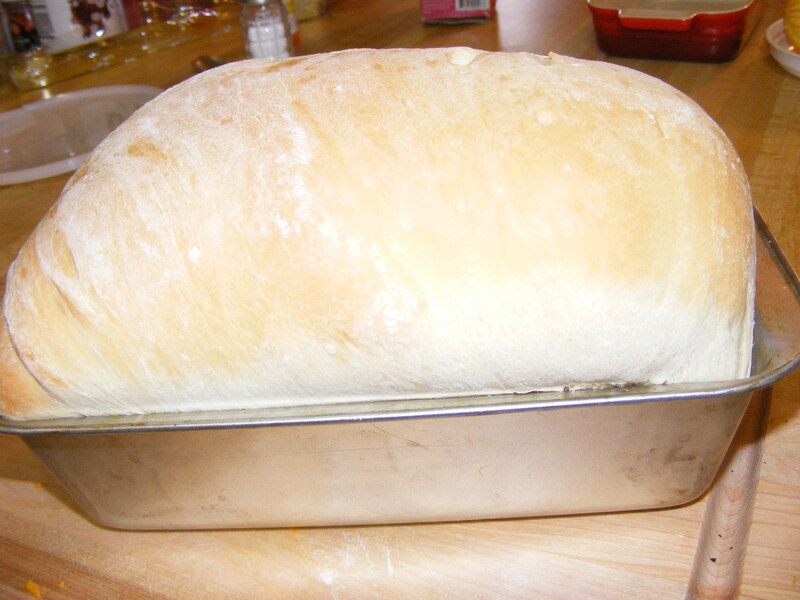 Put into 1 large or 2 regular sized loaf pans which have been generously greased and floured. Put into a preheated 325 degree oven for half an hour. Reduce the heat to 300 degrees and continue baking for 1 to 1 1/2 hours (depending on the size of pan). I chose not to put alcohol in or on my cake, however, if you wish to do so you can brush the baked cake with dark rum or brandy. One of the original recipes I used for reference in creating this cake after came from Litchfield Cookery. It was published by the Methodist church ladies in Litchfield, CT in 1897 and sold for 25 cents. 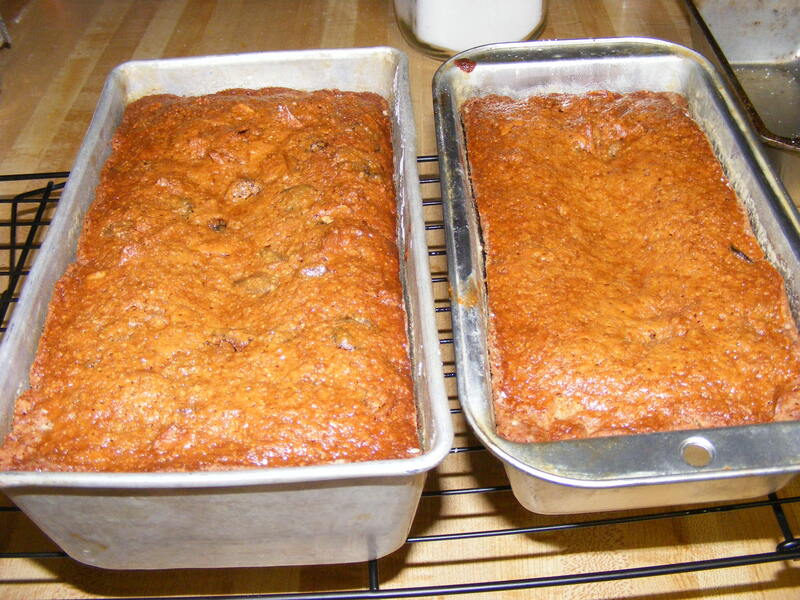 DRIED APPLE FRUIT CAKE. Soak 3 cupfuls of dried apples in cold water overnight. 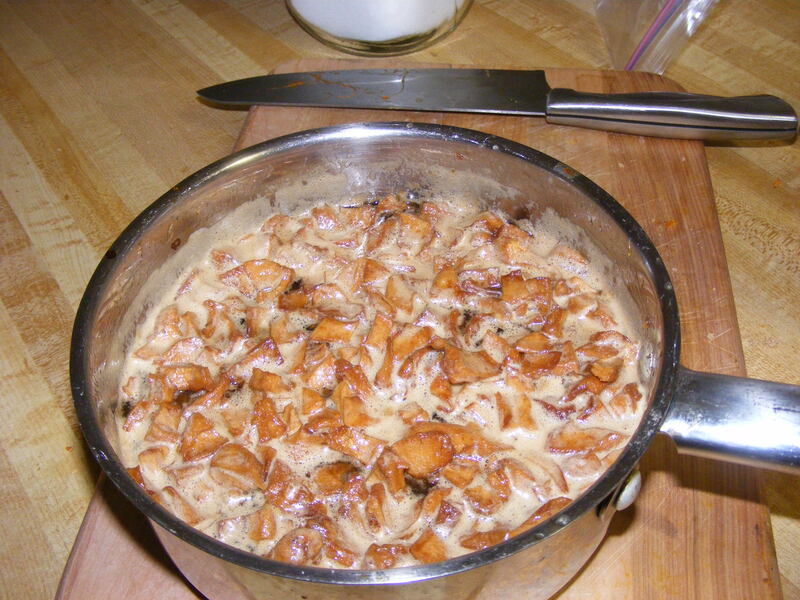 Chop them in the morning, and stew them until almost soft in 3 cups of molasses and 1 cup of raisins. When cold, add 3 cup of flour, 1 cup of butter, 3 eggs, 1 teaspoon of soda, all kinds of spices to suit taste. Bake in a steady oven. Raisins may be omitted. Merry Christmas & Blissful Meals yall. Finished product - golden brown goodness. I tried baking a loaf of bread when I was a young bride. It was pretty bad. It was bad because I hadn’t yet learned that we get out of our food what we put into it. I’d hastily thrown it together and expected the ingredients to miraculously morph into a loaf of bread. If you want instant results, buy bread or use a bread machine, but if you’re willing to invest a little love and a little time the loaf you’ll produce will be well worth the time you spend making it. Heck, the smell alone is worth the effort. The most important step in making bread is to proof the yeast. Don’t panic. It’s far simpler than it sounds. Find yourself a large measuring cup or small bowl and put the warm (not hot) water into it, stir in the sugar (or molasses, honey, or other sweetener), and the yeast. Now stand back, and let it do it’s thing. After about 5 or 10 minutes it will become creamy, will begin to bubble, and look nothing like it did when you first stirred it together. Do not use hot water. Hot water kills the yeast. Yeast is a living organism and like all living things needs certain conditions to grow. It needs a comfortable temperature, food to eat, and room to expand. Give it those things and it will perform well for you. Slowly add the bread flour to the yeast mixture, about a cup at a time, and stir it in. Start with a whisk and when it becomes too clumpy to stir with a whisk use a heavy spoon. Note in the photo above, the mixture is not while like the flour, but a creamy off-white color much like the color of the yeast as it came from the package. When it gets too difficult to stir in additional flour, turn the dough out onto a floured board or counter top that has been lightly sprinkled with flour and begin to knead it. If it is sticky, slowly knead in more flour until you can work it with your hands without it sticking to your fingers. The dough will become smooth and elastic. Don’t fret – if you’re worried you won’t know how long to knead it, rest easy. You can feel it as much as you can see the transformation. The dough will take on a satiny appearance and you won’t feel lumps as you knead it. Most of the flour added. 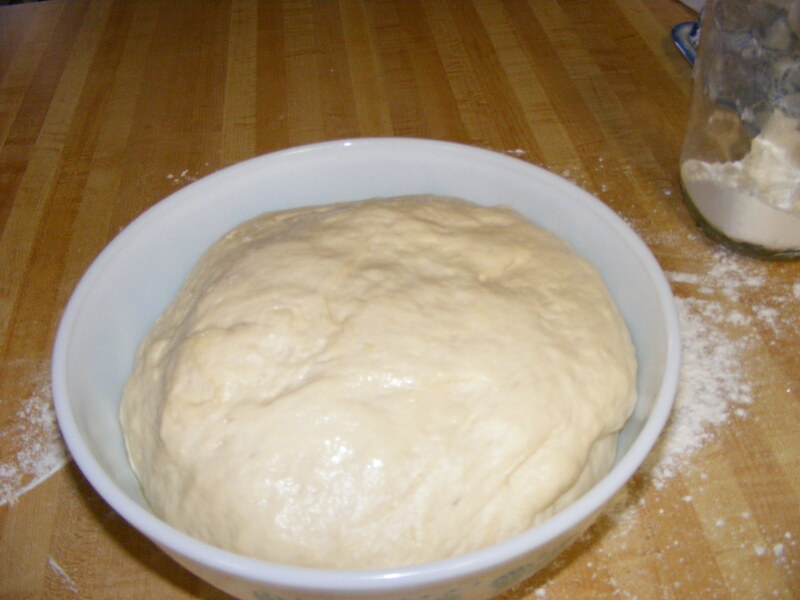 The dough after it's been kneaded and is ready to put away and let it rise. 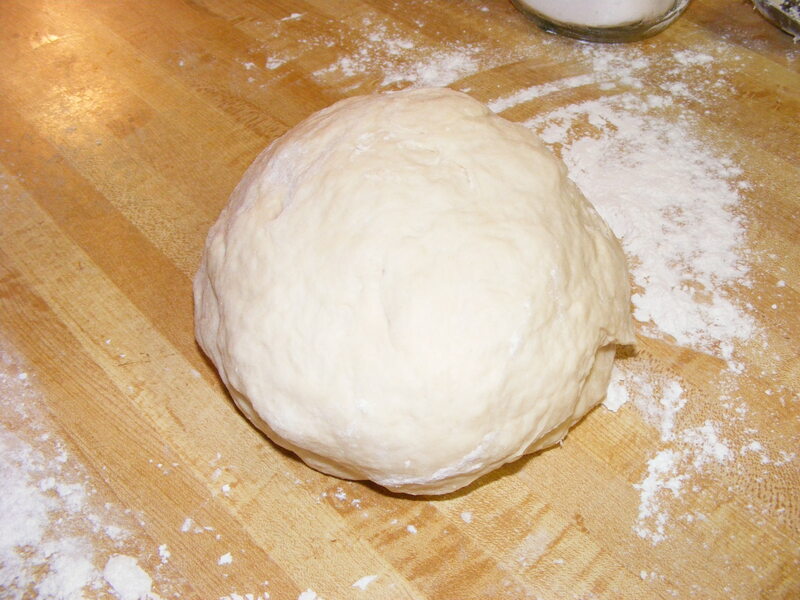 Kneading completed, find a large bowl, put in a couple of tablespoons of oil, and put in your ball of dough. Pick it up, turn it over, and put it back into the bowl so that the top of the dough is oiled. Tear off a piece of plastic wrap large enough to fit over the bowl. Spray the wrap liberally with cooking spray and then put it spray side down over the bowl. Cover the wrap with a clean kitchen towl. Put the bowl in a warm draft-free place and allow it to rise. A good place to let the dough rise might be inside your oven. Turn on the oven light and add a large pot of very hot water to heat the oven. Put the bowl inside the oven and allow the dough to sit until it doubles in volume. It is not a wise idea to heat the oven by turning it on – even a little. It only takes a moment to get too hot and then you have to wait for it to cool down to roughly 70 to 80 degrees before putting the dough in to rise. Gently warming it with the pan of hot water and the oven light works very well. Except in winter, placing the bowl on top of the hot water heater in my wash room works well also. It will take about an hour to an hour and a half for the dough to double in volume. Providing you’ve made a list, stick to it, and don’t live far away, you have time to run to the market and be back in time for the next step. If you feel some strong urge to do something menial and domestic, then you probably have time to dust and vacuum, maybe do laundry. If you find neither appealing, pour yourself a cup of coffee and pull out that book you keep meaning to read. The dough after it's risen. Not sure you’ll know when it has doubled in size? It’s not rocket science. Relax. You’ll do fine. Until you learn to judge this process for yourself (you do intend to practice, right?) you can put it into a plastic container and mark on it where the dough comes to before putting it away to rise. Go ahead and mark the spot on the container where the dough needs to reach when it doubles in volume. Put the container away as instructed before, watch it, and when the dough reaches your top mark on the container it is ready to proceed with the process and get it ready to bake. Putting rubber bands around the container is a good way to mark your levels if you prefer not to write on the container with a marker. Once the dough has doubled in volume it is ready to be shaped into loaves. 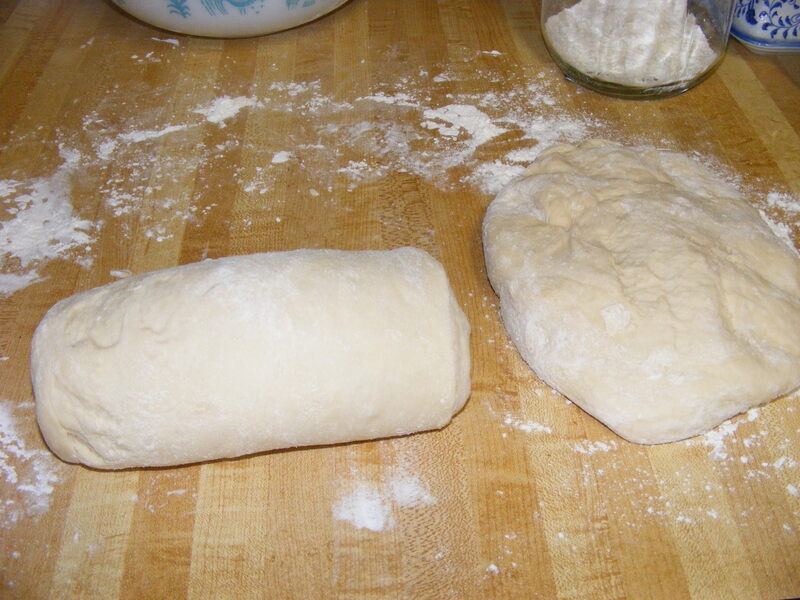 Set your container on the counter, make a fist, and put your fist right into the middle of the dough and push it down. You may hear a slight audible gasp. Don’t worry. While your yeast is a living organism it is incapable of feeling pain and you just knocked the wind out of it. You didn’t kill it. That’ll come later when you bake the loaves. Knead the dough again 6 or 8 times just to deflate it. Divide it into equal halves. Work with one half at a time. Press or roll it out into a rectangle roughly the width of the longest side of your bread pan and twice as long. You can fold this from one end about one third of the way then fold the other end down, again, one third. Or, you can do like I prefer to do and simply tightly roll the dough from one end to the other until it looks like the photo below. 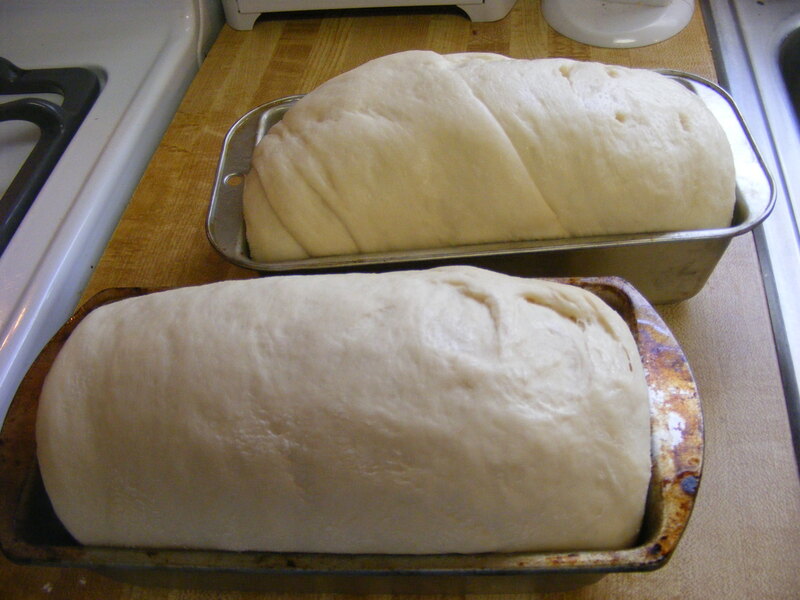 One loaf formed, the other ready to shape.Both loaves shaped and in the pans. Once in the pans, repeat the process with the plastic wrap and cooking spray putting a piece over each loaf. Spraying the wrap with cooking spray prevents it from sticking to the dough when it rises up above the rim of the pan. Place the pans back into the warm oven and let them rise until roughly doubled in volume again. Don’t worry. It’s a no-brainer. When they rise up over the top of the pan (see below) they’re ready. The second rising usually takes less time than the first. Second rising. The loaves have doubled in size in the pans and are ready to bake. Preheat the oven to 350 degrees. Place the loaves in the oven and bake them approximately 30 minutes. Approximately. Definition: Very nearly but not absolutely (Courtesy of Mr. Webster). That means it may be done in 25 minutes or it may be done in 35 minutes – feel your way around this one. The loaves may rise a little more in the oven. Don’t be alarmed. It’s just the yeast doing what it’s meant to do. When the tops are golden brown and you can top on the top of the loaf with your finger and it sounds hollow – like thumping a watermelon – the loaf is done. When you turn it out the body of the loaf should be firm but not hard. Practice makes perfect. If it’s doughy just give it a little longer next time. If it’s dry, shorten the baking time. Baking isn’t rocket science, or any science (unless you count the reproduction and burping of the yeast), it’s an art and art has room for individuality and variance of circumstances. For bread those circumstances can be the temperature of the flour when you started the process, the temperature while the dough was rising (it’ll never be the same twice), the quality of the flour, the liveliness of the yeast, etc. A baker manipulates those conditions and ingredients to produce an end result just as an artist manipulates paint on a canvas to produce a picture. The same variables – temperature, quality of ingredients, etc. – influence how long it takes the paint on that picture to dry. See where this is going yet? Anyone can be a good baker. Anyone who is willing to buy good quality ingredients, take their time while measuring and mixing them, put a little of their heart into the loaves when they set them away to rise, and add a little love when you put them in to bake. It’ll take longer than buying a loaf of bread or throwing ingredients into a bread machine, but you’ll end up with something you’ll be proud to serve your loved ones and it won’t be chock full of preservatives and extra sugar. And, the winner is........ Now wasn't that simple? In a large bowl, dissolve the sugar in the warm water and whisk in the yeast. Set aside and allow it to proof. When it becomes a creamy foam you may proceed. Mix the salt with a couple of cups of the flour. 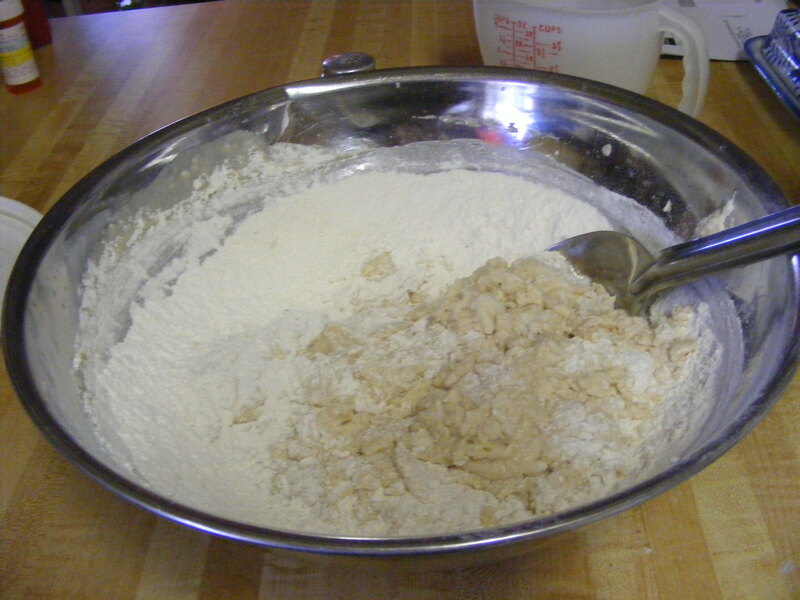 Add the oil to the yeast mixture and pour into a bowl with a cup of the flour/salt mixture. Whisk together. Add the 2nd cup of flour/salt mixture. Whisk together. 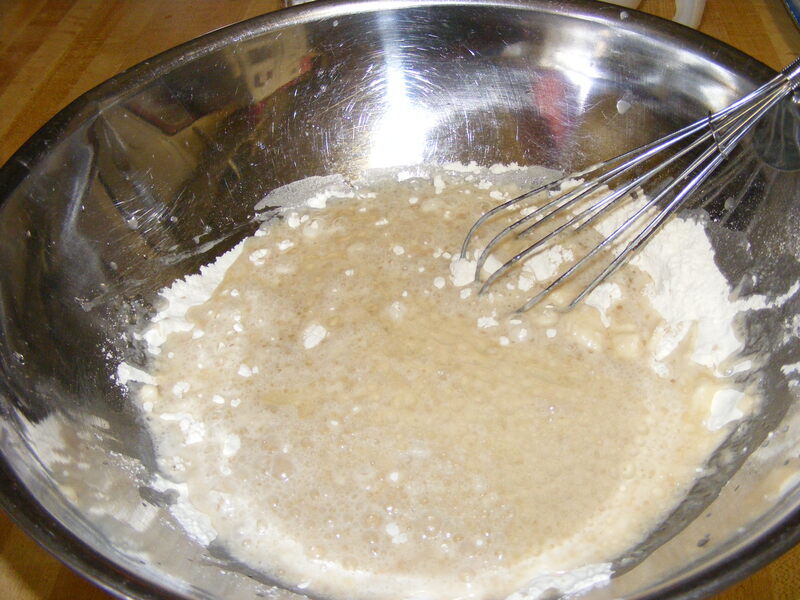 Continue to add the remaining flour, 1 cup at a time, and stir it in with a sturdy spoon before adding another cup. You should need all or most of the full 6 cups of flour. 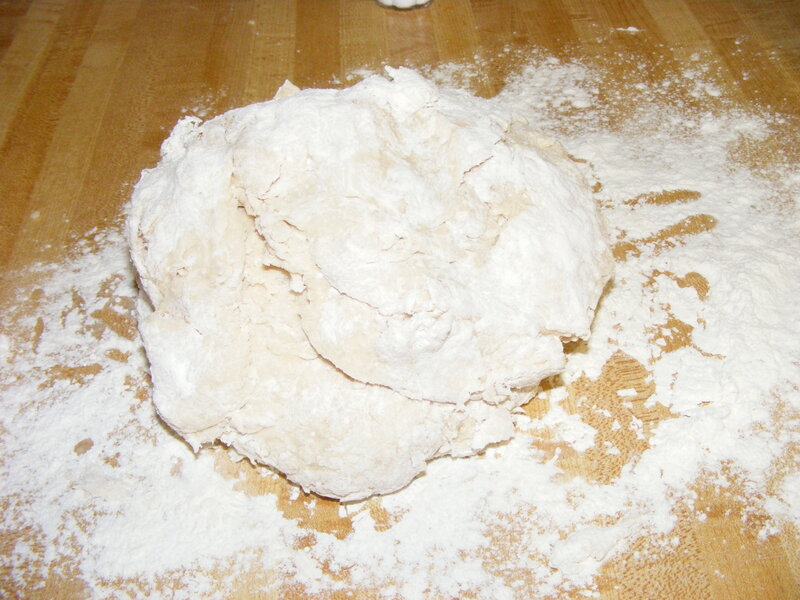 Turn the dough out onto a lightly floured surface and knead 5 to 10 minutes (see above). Put into a large oiled bowl, lift out, turn upside down and drop back into the bowl (see above). Follow the instructions for covering the dough and allowing it to rise. When doubled in volume, punch down and shape the loaves. Allow the loaves to double in volume. Place into a preheated 350 degree oven and bake approximately 30 minutes (see above). Enjoy. Although it’s hard to resist when it first comes out of the oven, the loaf will retain its shape better if allowed to cool somewhat. Blissful Meals, Yall, slice the bread and pass the butter.